Translators are often asked to export translation memory data (TMX files typically) to deliver with their work. Although this is fairly simple to do in memoQ, too often more than just the required data is sent by mistake. Select the TM from which to export via Tools > Resource Console... > Translation memories or Project home > Translation memories. Click Export to TMX to export all the data in the chosen TM. If a selective export (just some of the data in the TM) is desired, click Edit, enter the filter criteria in the dialog that appears and click OK. 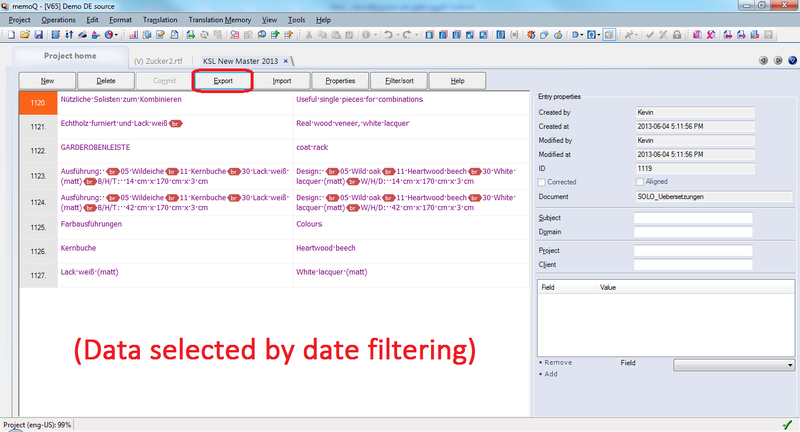 It is also possible to filter in the editor view. Only the data shown will be included in the TMX file created. The memoQ TM editor with filtered records shown. Click to enlarge. Ten brownie points to anyone who can figure out where I "cheated" with the translation information shown in the video. You did not filter the segments of June of last year, but of 2013. Anyway, there is one more hidden feature, the project TM that directly exports a project-related (or a doc-related or a view-related) TM to TMX or other formats. Unfortunately it is hidden in the Stats dialogue (e.g. Swordfish has a simple menu command for this). Thank you so much for this video - awesome! !